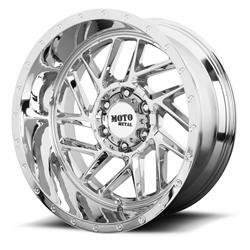 MO985 Gloss Black-Machined Wheel 20x9 94-18 Dodge Ram 1500 [Moto Metal MO98529085318 Wheel] - $229.95 : 3rd Strike Performance, Your Source for Late Model MOPAR Performance Parts and Accessories! 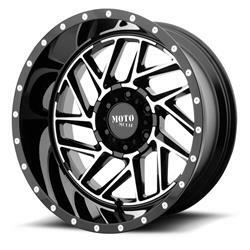 Moto Metal Series MO985 Breakout gloss black wheels with machined spokes are available in 20 in. diameters, with a variety of bolt patterns, and offsets. Crafted from first-rate heavy-duty cast aluminum, these gnarly-looking wheels deliver distinctive style, perform solidly, and ensure superior longevity. Satin Black with Machined Accents, 20 in. x 9 in., 5 x 5.50 in. Bolt Circle, 5.710 in. Backspace, +18mm Offset, Center Bore 78.00 mm/3.071 in.